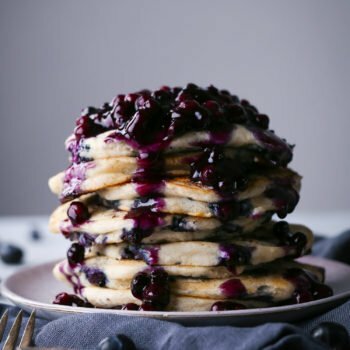 These pancakes are simple to make and are filled with sweet juicy blueberries! Top with my easy blueberry sauce for even more berry flavor! Vegan friendly with a gluten-free option. In a small bowl, combine milk and vinegar. Set aside to sour while preparing the rest of the ingredients. Place dry ingredients into a large mixing bowl—flour, baking powder, and salt. Add maple syrup, oil, and sour milk, whisking just until combined. If batter is too thick, add a few more tablespoons of milk. Preheat griddle or non-stick pan over medium-high heat. Brush a little oil over the pan to keep it from sticking. I prefer oil over butter, because butter can burn easily and give your pancakes a bitter taste. Save the butter for spreading on top at the end. When the edges begin to look done, flip the pancake and cook until the center is fully cooked. Repeat with remaining batter. Top with blueberry sauce or maple syrup and serve. Makes about 8–12 pancakes, depending on how large you make them. Place 1 cup of blueberries in a medium saucepan, along with water/juice and bring to a simmer over medium high heat. Mash berries to release their juices and then sweeten to taste. Stir in other cup of blueberries and cornstarch/water slurry. Continue cooking for a few more minutes, until sauce has thickened. If sauce is too thick, add a little more water. Serve hot over pancakes.